Apparently, the newspaper reporter Stanley Stobbs has been on the verge of exposing the Shredder’s underworld crime syndicate to the masses. To silence him, the Shredder sends Bebop and Rocksteady to poison the tap water of a local seafood restaurant where Stobbs is dining. The waiter draws a glass of water to serve to Stobbs. Stobbs crashes through the kitchen, demanding to have his lobsters to go and empties the restaurant’s whole tank. He bursts through the wall onto the pier and is confronted by the Turtles and Ray Fillet. Thinking the Turtles are trying to steal his lobsters, he attacks them and they get into a fight. After a few seconds, Ray Fillet calls off the fight and explains to Stobbs that he can’t EAT lobsters because he IS a lobster. Stobbs is saddened, but Ray Fillet assures him that he’ll learn to enjoy life in the ocean and that there’ll be plenty of lobsters for him to hang out with. As Stobbs and Ray Fillet head to the water, Michelangelo remarks that Ray is the “least shellfish guy” he knows. Gah. *The story continues in TMNT Magazine (Welsh) #2. *Being a magazine, this and every other issue contain additional content such as articles, safety tips, tutorials, games and the occasional behind the scenes stuff. I will only be covering the comic content in my reviews. *While some might feel inclined to categorize these TMNT Magazine strips as part of the Archie TMNT Adventures universe due to the creative team, storytelling/art style and the characters involved, future issues will include conflicting origins for established Archie characters, rendering the continuity incompatible. Maybe they're canon with the TMNT Cereal comics, though? Who the hell knows. *On the cover you’ll see a poster for The Puma Blues. The Puma Blues was a comic written by Mirage staffer Steve Murphy that occasionally contained Ninja Turtles content. Special thanks are in order for several members of The Technodrome Forums, including "Enscripture" and "Wilddiverse", for helping me get my hands on these obscure, long-forgotten comics. I appreciate it, guys! Anyhow, the majority of these little four-page jobs are formulaically identical. Someone or something gets mutated, the Turtles fight it, they win, there’s a bad pun in the last panel. There are a few exceptions, but that’s mostly how it goes. That said, they boast an assortment of familiar supporting characters from the Archie comics as well as one or two characters from the Playmates toyline who never got ANY media support elsewhere. As such, they’re neat little curiosities. “Seafood Surprise!” in particular features an original villain in Stanley Stobbs. 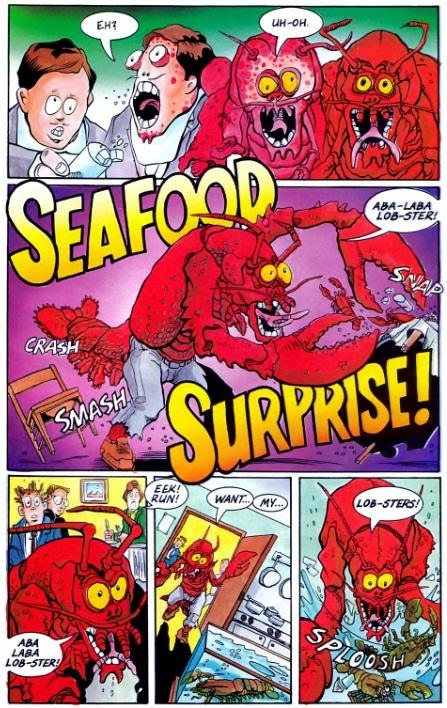 He isn’t given a mutant name, unless Murphy (Clarrain) intended for “Aba-Laba-Lobster” to actually be his new identity (or "Lobsterdude" like on the cover?). It’s a goofy little comedy relief strip and there isn’t much to talk about, BUT I do find Shredder’s implied cruelty sort of interesting. Rather than kill the people who would challenge him, he turns them into hideous monsters that will be ostracized by society and forced into reclusive lives of shame and misery. That’s kind of WORSE than just straight up murdering them, isn’t it? Also, hey, Man Ray! Or Ray Fillet. Whatever. 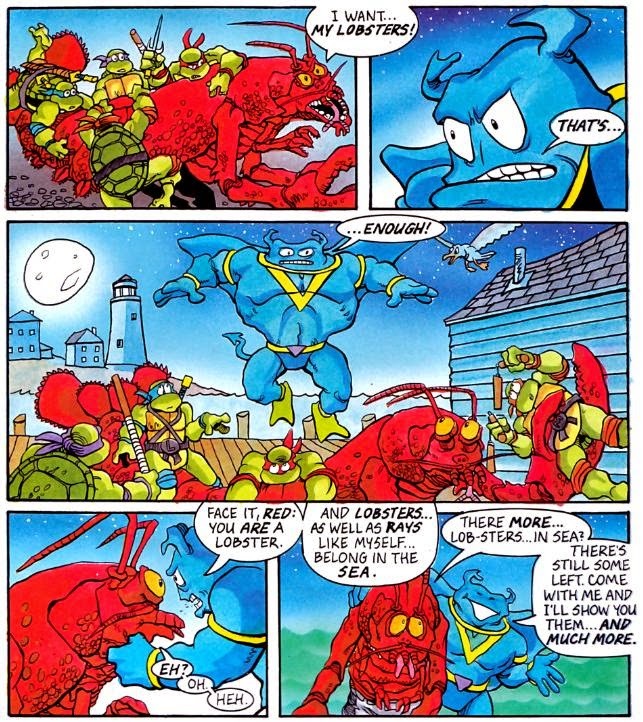 Ray usually amounts to Buzzkill: The Character, since whenever he shows up in the Archie Comics it’s to initiate a plot involving whaling or deforestation or some other environmental concern. Luckily, the four-page gag nature of this strip doesn’t allot him enough time to bring everybody down with his Captain Planet routine. He DOES manage to slip in a line about there being “a few lobsters left”, passive-aggressively admonishing the excessive trapping of New England’s lobster population to appease human consumption. But whatever. If you want to read a terrible Man Ray story, go check out Mighty Mutanimals #8 and then get back to me. Anyway, I’m not going to grade these because they’re kind of dumb and short, but neat nevertheless. 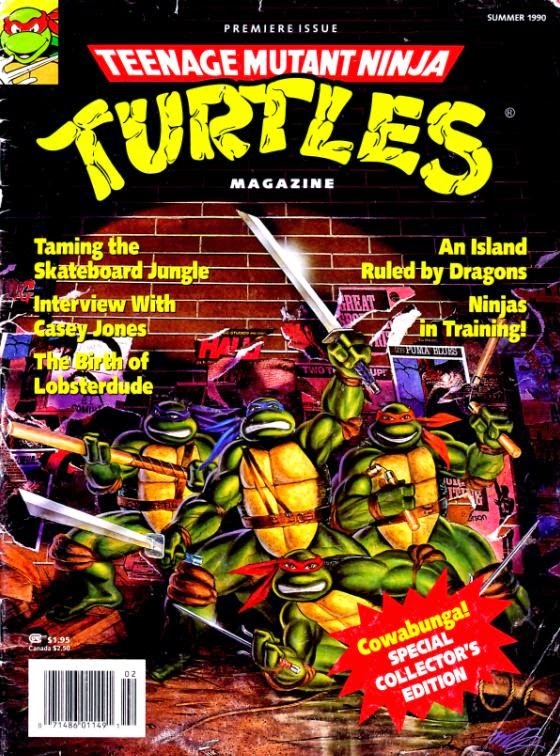 Once you're done with Welsh's TMNT magazines, maybe then you could move on to the TMNT movies, the movie adaptation comics, the movie prequel comics, and the Sushi Turtles stuff. Did Lawson really draw that? His artwork is usually better than that. Thats his style for someof the archie and movie stuff. Ps...love the image from this cover. Seen it elsewhere too.